When is it (not) a good time to do maintenance? With the global nature of the Internet and globalisation of businesses, there’s never really a good time to do maintenance. When it’s 1am in London, it’s 5pm in Silicon Valley and people are trying to wrap up their work day, and it’s first thing in the morning in Hong Kong, neither are going to be happy if they have a maintenance outage to deal with at such important times of the day. So, you choose your disruptive maintenance windows carefully, to try and cause the smallest impact that you can. However, if you know the users of the system are local, it’s much easier to choose your maintenance windows: usually when there are the least users on the system. Try telling that to Transport for London. 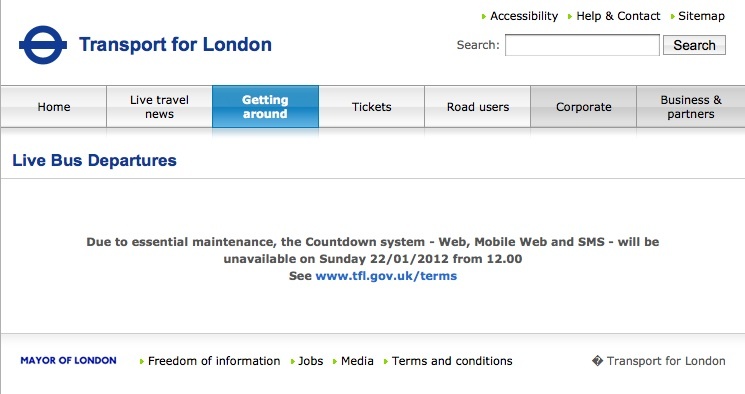 This is the front end to TfL’s “Countdown” system. It tells you which buses are due at a given bus stop and an approximate time that they arrive. The countdown database is updated using location equipment on the buses, and drives LED displays at bus stops, and is accessible over the Internet, including a user interface designed for mobiles, and via SMS short code. It’s especially useful when services on a route are infrequent, such as on a Sunday, where you may be looking at waiting up to 20 minutes for a bus if you managed to just miss the previous one. So, look back at the screen grab above, note the start time for the maintenance window. Why do TfL think it’s a great idea to take the system down right at the time on a Sunday that people are heading out to visit family, maybe go out for Sunday lunch, or head to sporting events? Wouldn’t a better time be the middle of the night on a Monday, when things are much quieter, with fewer users? Paying techs extra to do system maintenance on a Sunday can’t be cheap either? Are you sure they mean midday? I read that as midnight, which means they could do with adding an indication of which 12:00 they mean. Doing that maintenance in the very early hours of Sunday morning wouldn’t be such a bad time, although starting at 2am might be nicer as most people will have completed their night bus journeys by then. Probably. No, they definitely meant midday, as the system went offline just as I was about to use it to check when the next bus was to go out for Sunday lunch. Previous Previous post: End of the line for buffers?